Manuscript submitted August 5, 2010; accepted August 9, 2010.
β-cell function is lost in both type 1 and type 2 diabetes: In type 1 diabetes, β-cell loss results from autoimmune destruction, while in type 2 diabetes the exact mechanisms of β-cell functional deterioration remain poorly understood. Stem cells hold a great promise for providing an abundant source of cells for β-cell replacement. The generation of human embryonic stem cell lines, more than a decade ago, raised expectations for an imminent unlimited supply of all cell types needed in regenerative medicine. However, the initial optimism has been replaced by a more cautious view in light of the difficulties involved in realizing this potential. 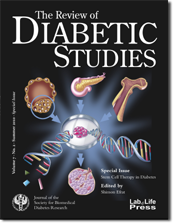 Nevertheless, harnessing the potential of embryonic stem cells for diabetes cell therapy remains a very attractive prospect. In recent years, induced pluripotent stem (iPS) cells, derived from several differentiated tissues, have joined the ranks of pluripotent stem cells. Their relative advantages, and disadvantages, in the generation of various differentiated cell types is a heated topic of debate. Other sources of stem cells, including fetal and adult mesenchymal stem cells (MSCs), are also being intensely investigated for their potential to form insulin-producing cells, or for their indirect use to support tissue regeneration and transplantation. The transdifferentiation potential of several pancreatic cell types, including duct, acinar, and islet α-cells, as well as cells from developmentally-related organs (e.g. liver and intestine), is being explored by several research groups. The existence of stem/progenitor cells in adult pancreas remains a controversial issue. However, the plasticity of mature pancreatic cells appears to be higher than originally expected. This may be exploited for both in-vivo β-cell neogenesis, and ex-vivo nuclear reprogramming. Finally, the renewal potential of the β-cells themselves is being studied for in-vivo regeneration from the residual β-cell mass, and ex-vivo expansion of cells from human islet donors. In addition to the cell source, recurring autoimmunity in patients with type 1 diabetes, and allograft rejection (when allogeneic cells are involved), are other crucial challenges which must be addressed, before these approaches can be transferred into clinical practice. The nine articles in this RDS special issue, comprising seven reviews and two original contributions, present a reference work of the fervor of activities in this exciting research field. The first two reviews, by Chee-Gee Liew and Malgorzata Borowiak, describe the way insights from pancreatic islet development are being applied for directing pluripotent stem cells towards the β-cell fate. Particular attention is given to methods of differentiation and transcription factors. The following three reviews, by Hirofumi Noguchi, Isabelle Houbracken and Luc Bouwens, and Cheng-Ho Chung and Fred Levine, address aspects of β-cell generation by reprogramming of other pancreatic cell types. The final two reviews, by Valeria Sordi and Lorenzo Piemonti, and Carmen Fotino et al., present the technique of using MSCs as supporting cells in islet and β-cell transplantation. This approach takes advantage of the ability of these stem cells to assist in tissue repair, and modulation of immune responses. The two original contributions, by Pere Santamaria et al. and Sachin Kadam et al., describe two new cell sources for β-cell generation. The first is an iPS cell type derived from human epidermal keratinocytes, which can be generated from autologous cells. The second is a MSC type obtained from human placenta, an abundant and easily obtainable human tissue. The novelty of the latter study is the demonstration of the potential of undifferentiated (in contrast to differentiated) placenta-derived MSCs to revert hyperglycemia to normoglycemia. Also, the use of biocompatible macrocapsules for transplantation of islet-like cell clusters to overcome the immune rejection adds to the current knowledge. Clearly, much more work is needed before stem cell therapy for diabetes can advance to the clinic. However, the intense activity in this research area, and the rapid progress in recent years in understanding stem cell biology, feeds the hope for clinical trials involving engineered strategies for cell replacement in diabetic patients, in the not too distant future.